» Forum » All Pinball » Why are licensed themes the rule, not the exception? » Why are licensed themes the rule, not the exception? Why are licensed themes the rule, not the exception? There are 97 posts in this topic. You are on page 1 of 2. I feel like a pinball machine should be like an original piece of fiction with choose your own adventure flavors, vs modeled after an existing story. There is so much cognitive bias with mass media themes it’s almost impossible to create something appealing, unique and special. I guess that’s why I love the Dialed In effort so much, and cringe when I hear plans for “Munsters” and “The Beatles” (and I LOVE the Beatles). If you are going to license, pick one that is almost religious- STTNG being a great example and well executed. The shows’ followers were religious and fanatical. LOTR being another good example. The Harry Potter movies were born from works of (books). Pinball needs more unique art and story telling and fewer licensed themes compromised by cognitive bias. Interesting... I have no connection or interest in DI, but I am looking forward to The Munsters. I really don’t care if it’s themed or not. I buy for gameplay and the depth of the code. I have some great themed pins and some great unlicensed games. I am definitely buying the Munsters and just received the Beatles. I’m also not planning on selling my DI or WH20. Hopefully someday, they make Harry Potter. It's those fanatical followers that drive the manufacturers to obtain licenses. Think of all the Kiss fans who buy all kinds of Kiss-branded merchandise, no matter what it may cost. They were driving up the price of the Bally Kiss machine, and it was easy money for Stern to produce a new one. As for games on location, Gary Stern is fond of saying that the licensed theme helps to draw in the coins for that first play, then the experience of playing the machine takes over. The problem is the status quo. Just like movies and music, Hollywood and the music industry are not wrong that the masses don't like 'new unknowns'. Way more likely to lure people in with something that is overly popular than something that is unfamiliar. Because licensed themes have proven they can draw a large audience. Just wait I believe we are in for some surprises in 2019. How well has Oktoberfest been recieved or how well has Houdini done? Is Houdini a licensed title? Oktoberfest? Did they have to get rights from the City of Munich or the estate of Harry Houdini? Total Nuclear Annihilation? If it is not a licensed theme it better have some kind of name recognition or innovative feature to draw you in. Historically, it all used to be unlicensed generic titles and themes, with the Brand/Title being the most important aspect since name recognition by manufacturer and loyalty to table makers (by operators and distributor) was higher in the old days. You played a Bally Wizard, or a Williams Flash and players cared just as much then for specific makers as they do now for Stern or JJP, or CGC, or Spooky, or API or the list goes on... The whole tie in with mainstream media was more due to Roger Sharpe than anyone or anything else, and the dance between the fact that although a license will not make the license owner a lot of money, a good license can make a pinball manufacturer a lot of profit by increasing sales even a moderate amount over a non licensed theme. I myself like non licensed titles (like Pinbot and his Bride), yet they are now licensed if you wanted to recreate them. Every new machine has to be able to answe the question, "what's this game's hook". The license is the easiest way to provide one, you're already working with somebody else's creative vision. But all classic franchises start out as original IPs, so if you're going the original route, the unified creative vision and personality is super, super important and there is more pressure upon you to bring something new to the table. Theme and art package are the only reasons I don’t own DI. Interesting post. This exact subject came up with a friend recently. I have recently introduced him to the world of pinball and he asked me what the most popular machines are. After telling him what most people universally consider to be some the top machines (medieval madness, monster bash, attack from mars, etc. ), he thought it was odd that many of them were unlicensed (that wasn't the exact word he used, but it is what he meant). My response was the gameplay. Not to say that there aren't top end licensed games (TZ, TAF, LOTR, etc. ), but it was alarming to him that they weren't more. I also believe that certain licenses actually work against themselves by turning people off. I think STTNG is a good game, but i would never buy it because im not a big star trek fan...i just appreciate the game play. The more casual pinballer wouldn't likely even give it a chance in the first place if they didnt like the license. I’m with you all the way. I want originality and creativity in my games - a game where I feel the design team really had a great time coming up with all this stuff, tying it together into a total package- creating something new. A pinball game should be a work of art in my mind, not a piece of merchandising. I can only hope more original stuff is on the way. It should be easier to create something appealing to a license. Unique? Unique from other pinballs, or what? Some of the best games out there aren't exactly unique. Licenses are always going to happen, because there is a perceived immediate win. People will play the game because they are fans of the license. But if the game is compelling, who cares if it is a license or not? Did they have to get rights from the City of Munich or the estate of Harry Houdini? I understand you can use creative licensing for the Houdini name at no charge. So licensed, technically yes....did it cost them extra....no. Not sure what to classify this game as. So stern can stay in business. The problem is that pinball isn't as popular as it was back in the day. Manufacturers cannot afford to take chances and they just don't pump out the games like they used to. Sure thing themes are a good way to keep the lights on. Say what you will about Mr.Stern but he is no dummy. The Silverball Museum, which is a block away from my office, has DI so I still get my fill. Pinball itself is not very appealing to most people, need a hook. Licensed themes tend to date poorly unless its timeless. I prefer unlicensed thems, but DI? Sorry, DI is a terrible example. Pat Lawlor is a master designer, but noting cab scream old person out of technology faster than that turd. It might be the greatest game ever, I still won't drop 10k on it because its laughably awful to look at. They’re easier to make on a tight schedule as characters, story, art, music, voices, feature ideas, mode concepts etc already exist. They sell better. People who buy pins for home will drop big money on something nostalgic or something they already love. They do better on location for the same reason they sell better. Themes sell games sight unseen. When amortized, the license costs maybe $100 per game and it's arguably the biggest selling point in the entire bill of materials. Great so you prefer unlicensed themes. But the only mass produced unlicensed theme of the last 18 years is "terrible" and "laughable" and you have zero interest in. So now you know why nobody wants to mass produce unlicensed themes. People put money into games with licenses. That's what drives coin drop. Routing games is so different from collecting them. Games that pinsiders think are trash can earn will on route just from a solid theme. I had a dialed in and it was a terrible earner. Even though I think it's a great game, I don't think people gave it a chance because at a glance it looks really lame and not based on a successful franchise. Less a pin and more a kid's redemption, but for what it is? Its fine, I like the translite (not a true translite, more a giant decal). The PF art is the stuff of nightmares when you take the plastics off. The sound effects are annoying, but its a kids ticket dispenser. If it weren't for its oddball size I wouldn't have it. It also did not cost me 10k. Do you walk up to it and say wow, that clown screams 1992? Nope, it could have been made 5 years ago from a theme perspective and no one would know. At this point the display and sounds are what really date it. So your argument is that because a senior citizen thought a game about cell phones would be a great theme it is our fault that they don't make them? How about the designer picked a terrible theme that is out of touch with the times because sometimes people make poor choices? As much as people dog on Mafia it looks great from a theme perspective. tokyo perfect drift, strange name aside, looks great too, but then did so did Captain Nemo. Were there licensed games prior to Wizard and Capt. Fantastic? Or were they even licensed? A game about cell phones? That shows what you know...fine you don't like it, but you clearly don't even know what the theme is, and may have never even played it (that's an exaggeration btw). Rant some more though..I mean, it's only pinball. Disclaimer: I don't own this pin, but I'd like to. It's ironic that most video games are unlicensed and almost all pinball machines are. Kind of proves that although licenses are powerful, that if you come up with good original IP it will do better than a license. I'm really surprised that no pinball manufacturer has done a licensed video game lately. Like Red Dead, GTA, Call of Duty, Mario, etc. There is a pretty big cross section of pinball players that also plays video games, seems like a pretty natural fit. An updated Mario machine would frankly blow the roof off sales, it's one of those universal themes. First manufacturer that does that is going to make major $$$. Super Mario by Gottlieb is, by most accounts, not a great game. However that thing kills on route, even now, 25 years later. Historically, licensed video games are horrible...probably in the 98% range of horrible. RCT was a videogame licensed pinball, and as has been said it didn't do so hot. I will agree it is surprising that they didn't jump on the GTA or Minecraft craze. I also can't believe Sega never did a Sonic Pinball machine (aside from the video pinball game). no he isn't, why is it so hard for you people to understand when it comes to pinball and most games theme matters. Happy for all who don't care but u are in the minority. I will agree it is surprising that they didn't jump on the GTA or Minecraft craze. BBH Pro also bombed when new, took a few years for it to gain a following. Part of it is that it is a game that is supposed to be the video game instead of the theme around a pin. A game about cell phones? That shows what you know...fine you don't like it, but you clearly don't even know what the theme is, and may have never even played it. Rant some more though..I mean, it's only pinball. Disclaimer: I don't own this pin, but I'd like to. Sorry, its not NOKIA the game. Its a game where we have a giant cell phone because they decided to heavily buy into its cell phone connectivity. A game where we have a guy holding up his cell phone like he is the it crowd's answer to he-man. Congrats on liking it, consider me one less person you will compete with to buy it and be happy for it. Doesn't change that this was a poor choice of theme. theme is still personal. Addams Family is huge - I hate the theme, hate the gameplay. I'm in the minority. It's just how it is, it in no way means the theme is bad or gameplay is crap. I don't hate on it, like some people like to hate on other games - like it is some sort of personal vendetta. Because they are better. I like both but prefer a licensed pin with a theme I love. 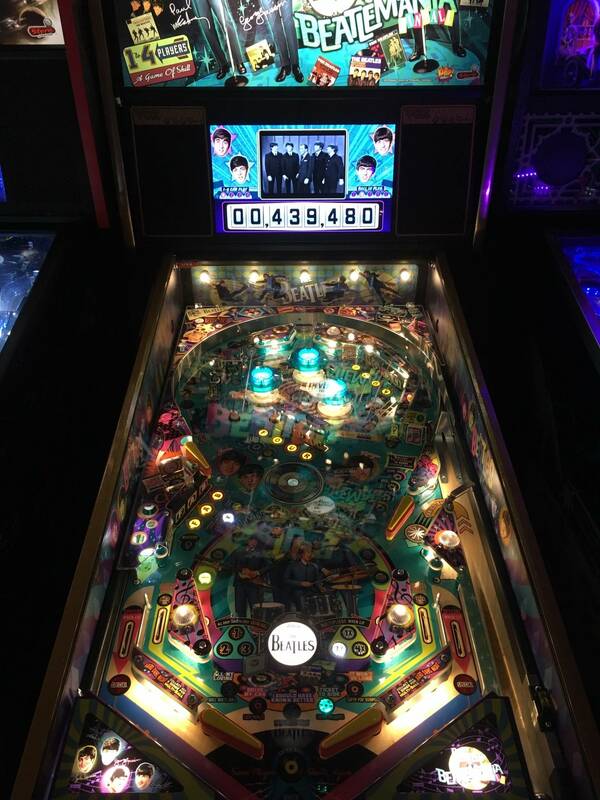 I didn't even know there was a BBH pinball? I advertise for more fantasy and Sc-fi themes (no, not Marvel). I've always heard Wizard was the first licensed game for having the likenesses of Roger Daltry and Ann-Margret. But I wouldn't be surprised if some EM guru knows of an obscure woodrail with a boxer on it or something like that. This. Licensed themes sell better. End of story. If that changed manufacturers will change what they make. In my opinion, the majority of people involved in pinball don't have the humor or writing chops to make an original game on par with themed games. Think about Marvel based games. They have teams of comics and writers and decades of material to work with and condense down into a pin. Fans can be good at reducing that down to a game's content, but you can't ask those same people to develop fresh material that resonates with people, especially on their first outing. I'd love to see an original game where they hire out the story to a real team of writers and comics, like they did for Deadpool. With the licensing fee they are paying for all of that pre-tested content. Thinking you can save money by making your own content is a red herring, IMO. It's a dead end unless you really have a ringer that can tell a compelling story. I buy for gameplay and the depth of the code. I am definitely buying the Munsters. I was at a barcade a few years ago and watched like 4 middle aged women walk in and they instantly lit up and walked straight to....Game of Thrones. Started talking about how they loved the show, blah, blah, blah, when right next to them was Medieval Madness and Attack from Mars. Do you really own 2 radical machines? Themes are super important to randos walking up to a pinball machine, or newbs with deep pockets.